Beautiful table, Valerie! I can't believe your lilacs are so far ahead of the ones in my area. Mine are barely starting to open...there is rain in the forecast for most of the next 10 days, so with the short blooming season and rain, I won't be able to really enjoy them as I would like. Hope my peonies don't get rained out, too! Those square chargers are gorgeous! The remind me of the white wood ones from Pier One. 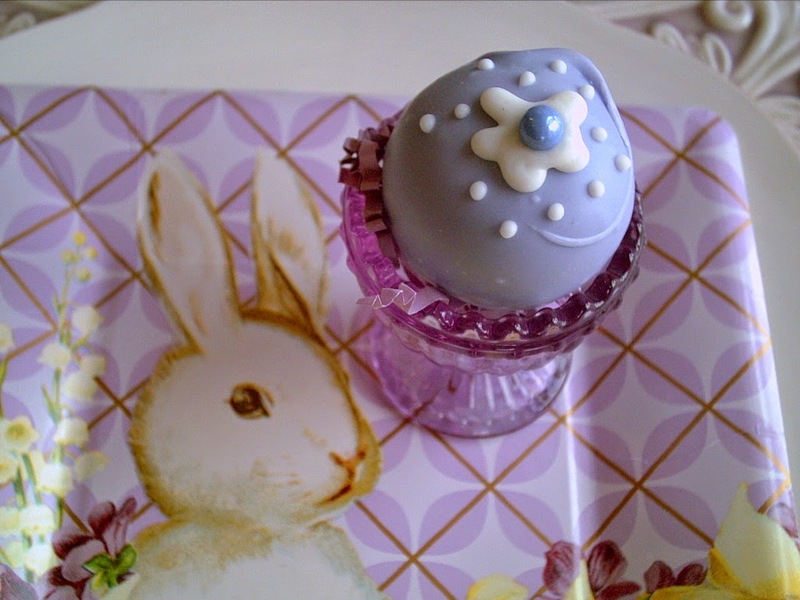 Love all the lavender, especially the little glass bunnies. 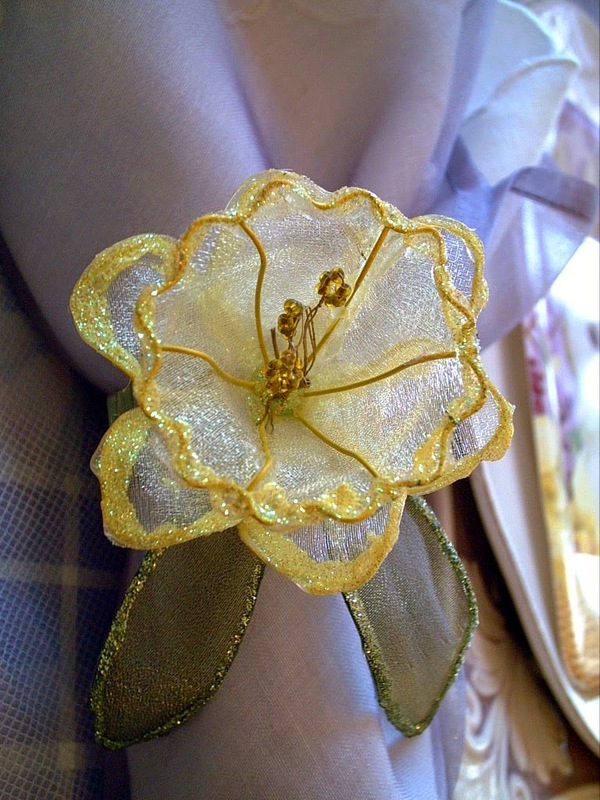 The flower napkin rings are so pretty...I can see them being used on an all white table, too. 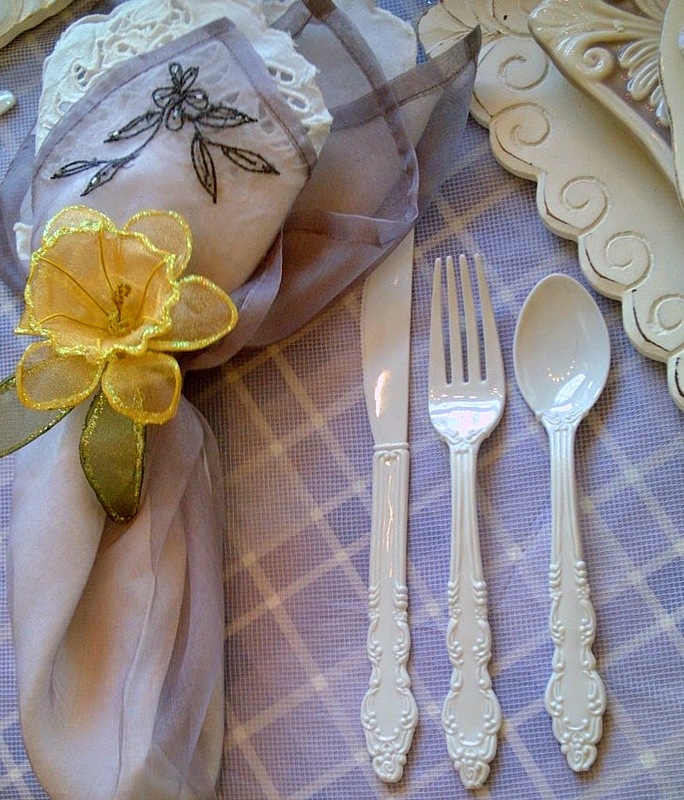 I do like the plastic flatware...I found some aqua at the thrift store a few months ago that I am getting anxious to incorporate into a tablescape. I have more ideas than time for tablescapes! We are months away from lilacs here in NY. I haven't seen a forsythia yet, and they are usually blooming by now. 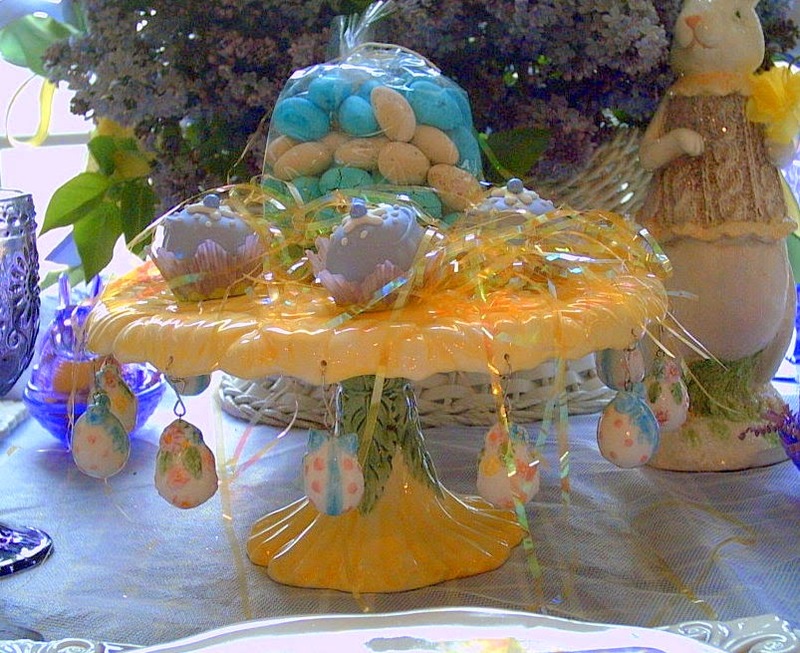 Your table is so pretty for Easter. I gave plates like that in a hostess basket, but they were paper! 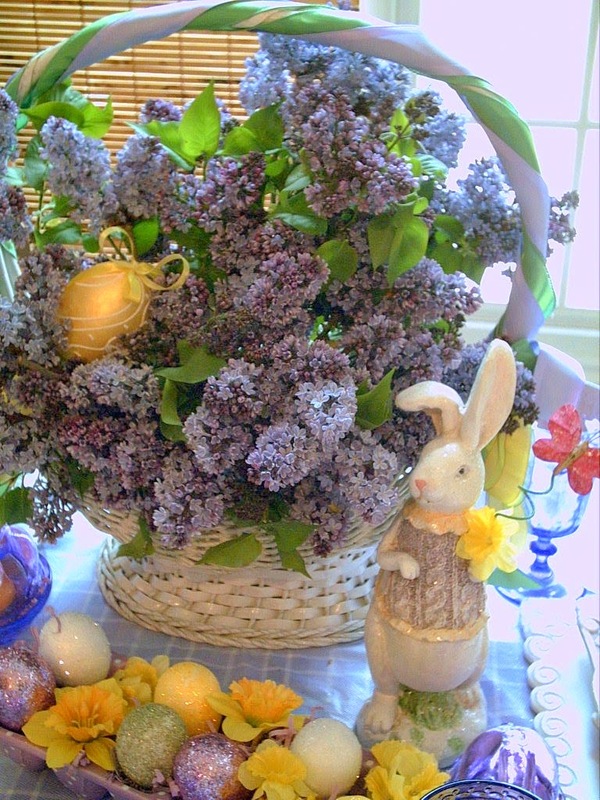 The basket of lilacs steal the show! I can almost smell them! Just breathtaking. 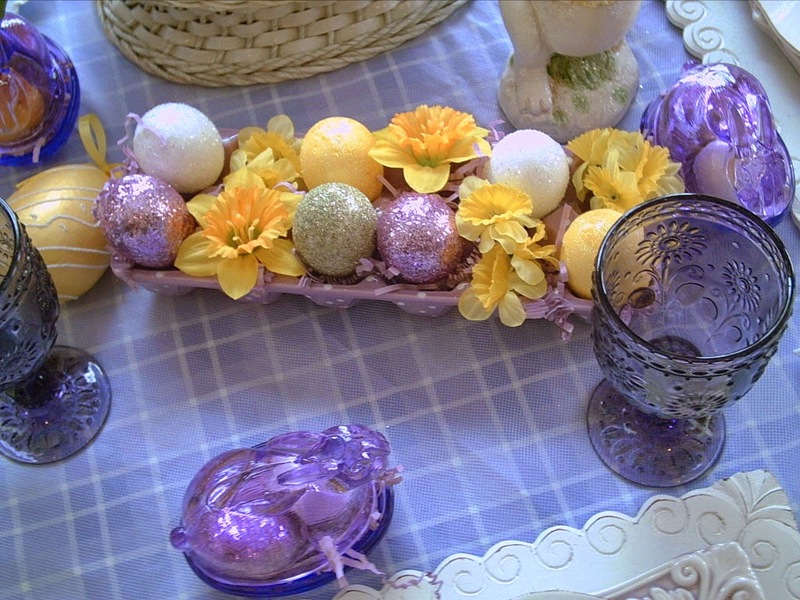 If I could reach in and grab anything from the photos, it would be the glassware and bunny candy dish! In Illinois all we have in bloom is daffodils, tulips and the hyacinths are about to bloom. My lilac bush has a lot of buds but it will be awhile until it's in full bloom. Thank you for sharing. Valerie, mutual admiration for each other's tablescapes this week! That basket of lilacs is gorgeous. It is hard for me to pick a favorite flower, but lilacs rank up at the top for me. My lilacs won't be in bloom for at least a month. 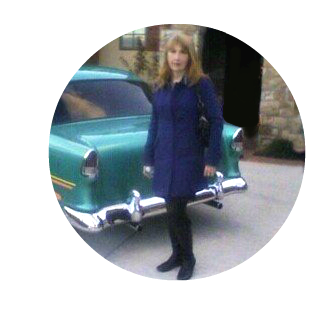 Absolutely gorgeous, Valerie!!! 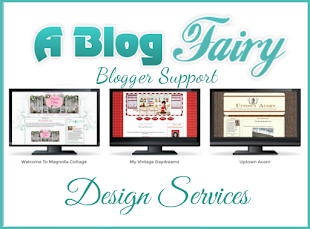 I smiled when I saw the title of your blog, as it made me think of "Hyacinth Bucket/Bouquet" on the Britcom "Keeping up Appearances." I love her and the show. You have a lovely blog. 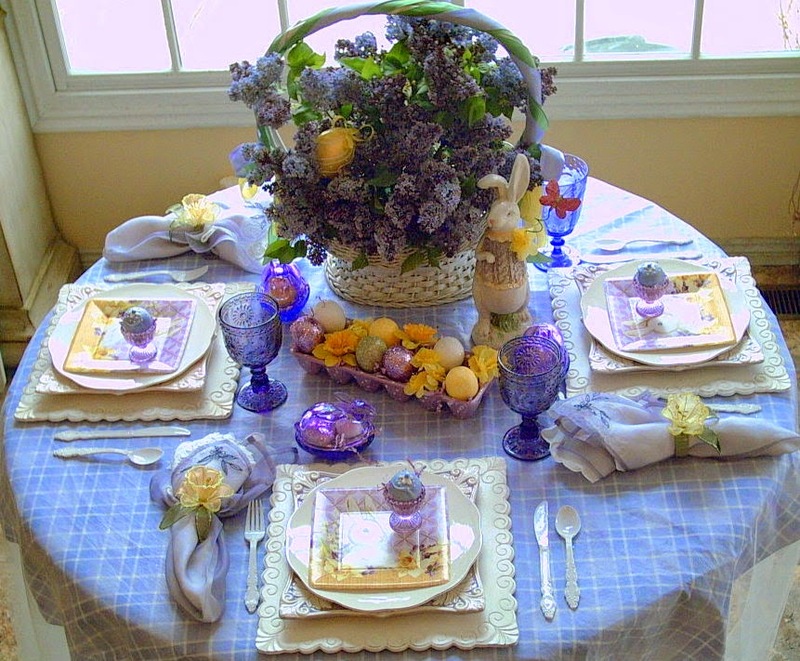 Oh my what a gorgeous lilac tablescape! I have the pretty lilac goblets and love them too. 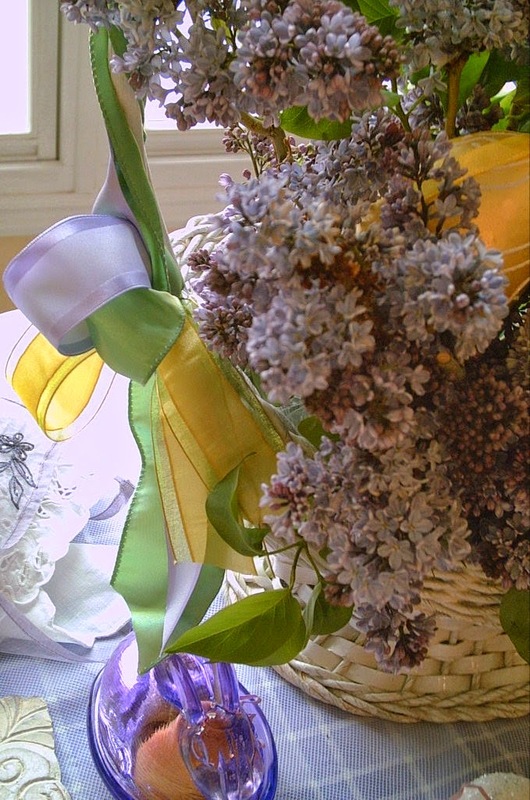 The basket with the lilacs is gorgeous! Love the way you died the eggs to match the tablescape. 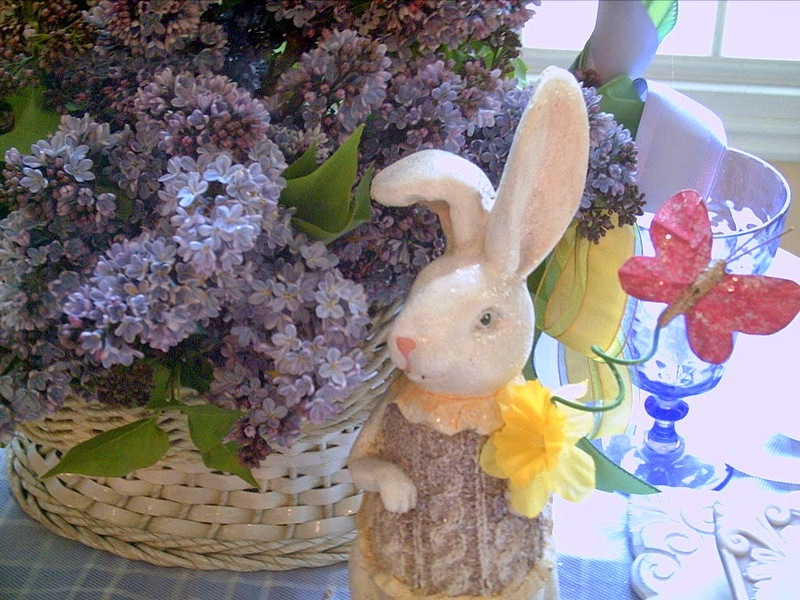 Your bunny plates are so whimscal and I love your lilacs! 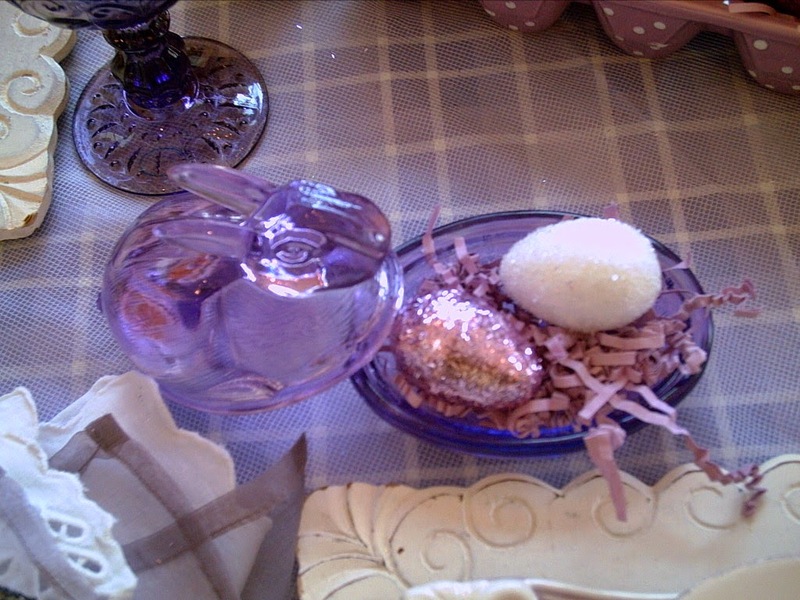 Hi Valerie, I love your lilac tablescape. Love the plates and the daffodil napkin rings. You are so lucky to have fresh lilac bushes. They make such a lovely centerpiece. Your lilac colored stemware are unique, you just don't find a whole lot of lilac colored glassware. Very beautiful and a touch of whimsy. I love the whole tablescape. Valerie, your table is so pretty! The way you used the sparkle pieces is wonderful I recently started a "Purple, plum and lavender" board on Pinterest and your table would be perfect to pin - love it!! Beautiful Valerie, just beautiful. 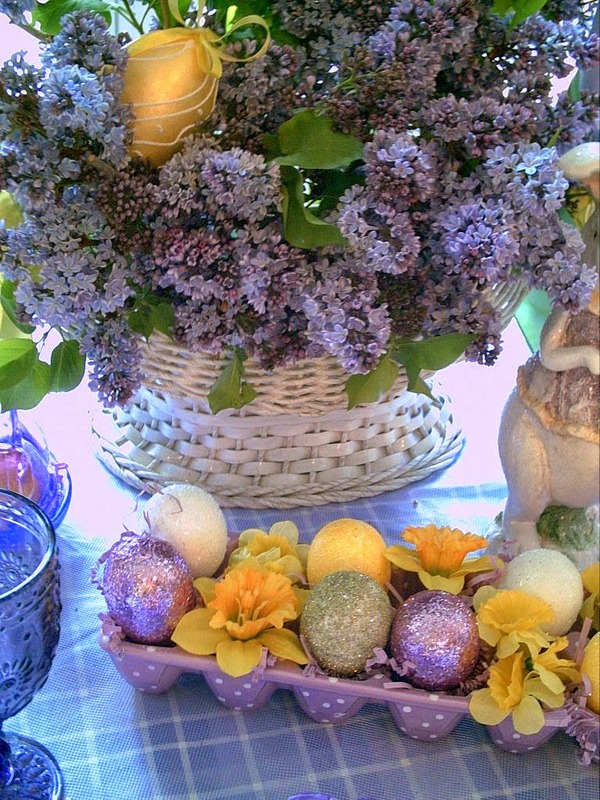 The lilacs in the white basket with the yellow Easter eggs is stunning, definitely at the top of my list for beautiful Easter centerpieces this year. The bunny plates, the lavender goblets, and lavender napkins with the gorgeous daffodil napkin rings are all just stunning together. You REALLY Are Incredible! So Talented! I Love Every Single Piece!!! Thank You for Sharing Your Amazing Settings, You Are Amazingly Talented!!!! 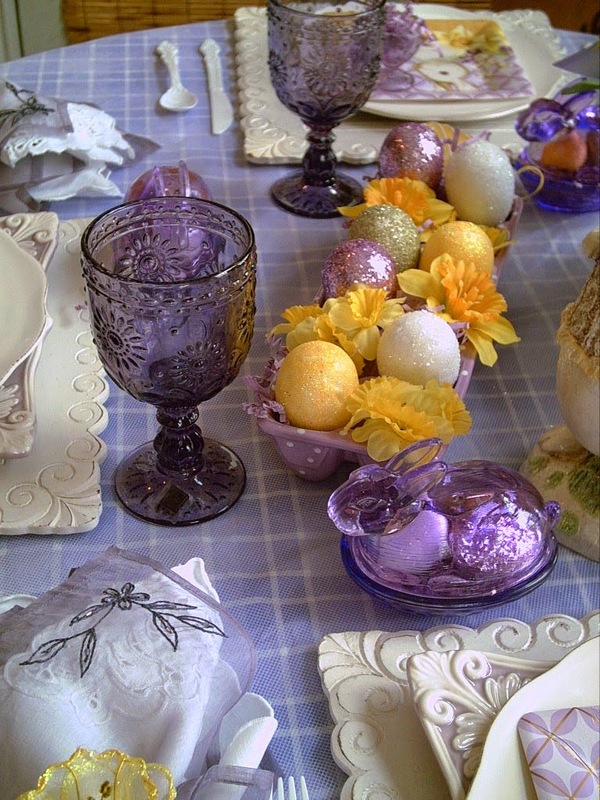 Oh Valerie...this Easter tablescape just takes my breath away! You did a fabulous job & I love all your pretty touches. You asked on my blog if I sell embroidered items, referring to the Easter Egg with the letter "V" on it. Although I don't sew for the public, I will be happy to make one for you. My daughter's name is Valerie also! I can't see a way to email you so please come back to my blog, The Gazebo House & click on the gazebo logo to send me an email with your snail mail address. I'll be happy to stitch up the exact same tea towel that I did for my daughter, since I have the design already to go. Valerie this is beautiful and I love the smell of lilacs! 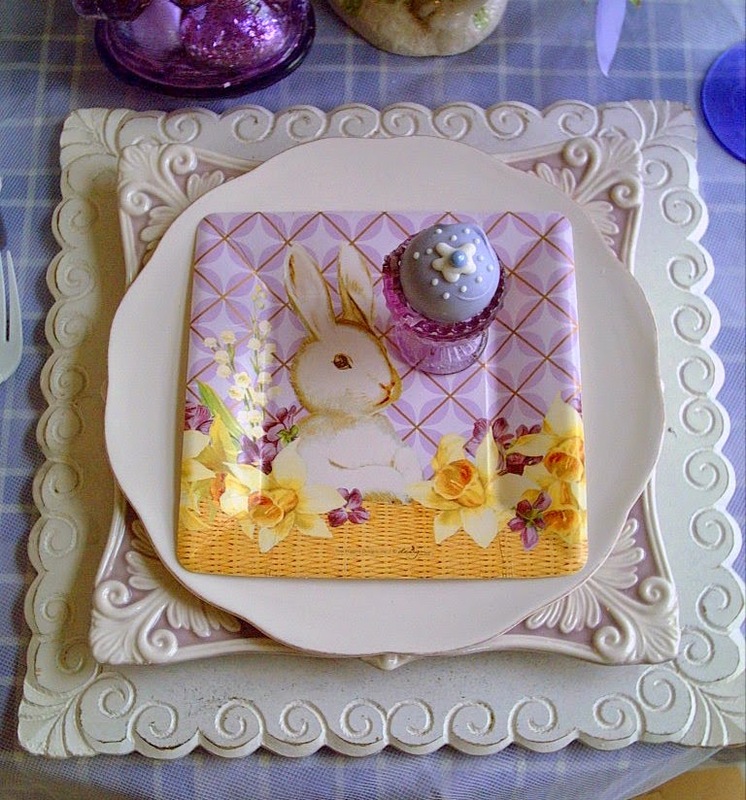 You have very tastefully brought all of these Easter/Spring elements together and created a lovely setting. Beautiful table setting. My lilacs don't blossom until the end of June. I like purple goblets, and the dishes are gorgeous.